I originally came up with this recipe as a pizza crust (which, by the way, I think is the best one so far), but quickly realized that it would also work well as crackers. As a pizza crust, it's a little on the crispy side (which I like), and as crackers they are a little on the soft side. If you like your crackers crispier, then simply leave them in the oven longer. Ideally the seeds should be soaked in water overnight, then dried in the oven or dehydrator on a low setting. Once dry, they can be stored in jars so they are ready when you want to cook. Grind the seeds before measuring out 1 cup each. I like to grind mine in a coffee grinder that I use only for seeds, nuts, and spices. Blend all ingredients with an electric mixer in a medium bowl. The dough will be very stiff. Vary the amount of olive oil based on how dry the dough seems- if it is wet enough with one tsp, then omit the second one. If you are adding herbs, garlic, or anything else for flavor, do it now. For the batch in the photo, I added 2 cloves of garlic and a handfull of chopped parsley (additional flavors are good for both crackers and pizza crust). Grease a cookie sheet and sprinkle it with coarsely ground pumpkin seeds. Pat the dough into a ball shape and place it in the middle of the cookie sheet. Beginning in the center and moving outwards, squish the dough flat with your hands. I suppose you could also cover it with waxed paper and roll it out with a rolling pin. I try to get it to about 1/4 of an inch. For pizza crust, you may want to make the edges slightly raised, for crackers, make it flat. For pizza- bake for 20 minutes (or longer if it looks very wet). Remove from oven, top with sauce and toppings, then return to oven for as long as it takes for the toppings to get hot and cheese to melt if you are using cheese. For crackers-bake 25-30 minutes, depending on how crispy you like them. Cut them into squares with a pizza cutter. If you left them in a long time to get crispy, you should cut them quickly while they are still a little soft. Top with hummus, yogurt or kefir cheese, or any other topping you like. If you made them on the softer side, you could cut them with cookie cutters to make them look fancy. 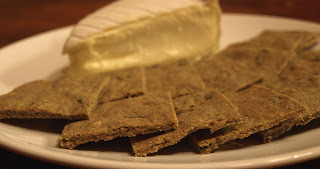 These have become my favorite crackers--even beating out the recipe I've been using for 6 years! Great idea Amoreena! I'll try doing them that way too. I especially like the idea of putting seeds on top. I just made these tonight and they are FABULOUS!!! Even my husband, who refuses to go full GAPS with my toddler and I, loved them :) it was a huge hit with our chicken soup tonight.. Now I can't wait for the next few weeks to be over so we can start to add cheese!